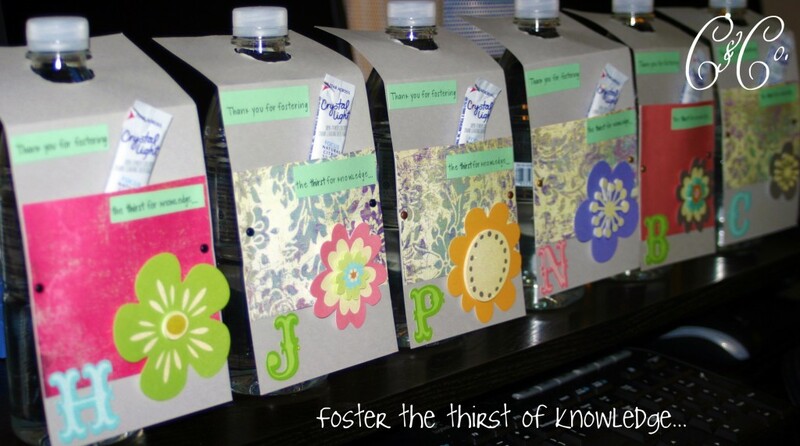 I’ve seen tons of these water bottle ideas given as teacher appreciation gifts all over the internet. These are easier to create than you may have thought. If you are looking for inexpensive gifts for your student’s teacher(s), here is my version and it was super simple. Not only is this a cute gift, but it certainly is something your teacher can use because it includes a bottle of water and a yummy Crystal Light packet for a great afternoon treat. 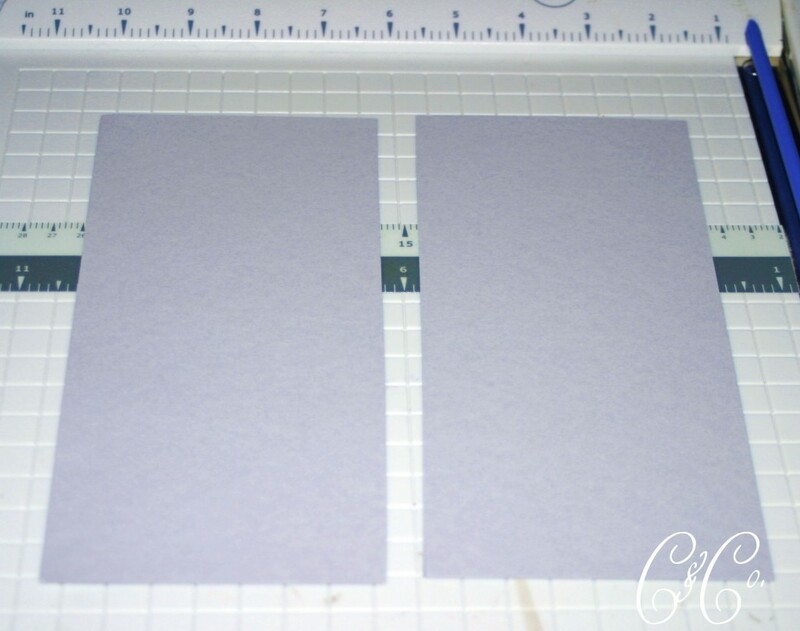 Cut your solid colored cardstock into 4 inch wide x 8 1/2 inch tall pieces. If you are using 8 1/2 x 11 sized paper, you can get two water bottle tags from one sheet and still have a sliver of paper left over. Use a bottle of water to trace the bottle cap onto the tag. You will want to trace this at the top of the paper in the center as the picture below illustrates. 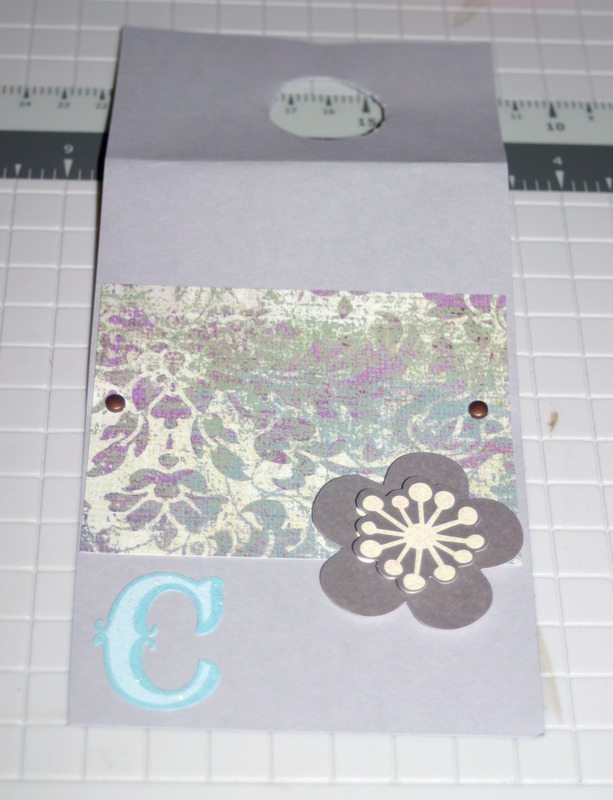 Take your decorative scrapbook paper and cut into 4 inch wide by 3 inch in tall pieces. 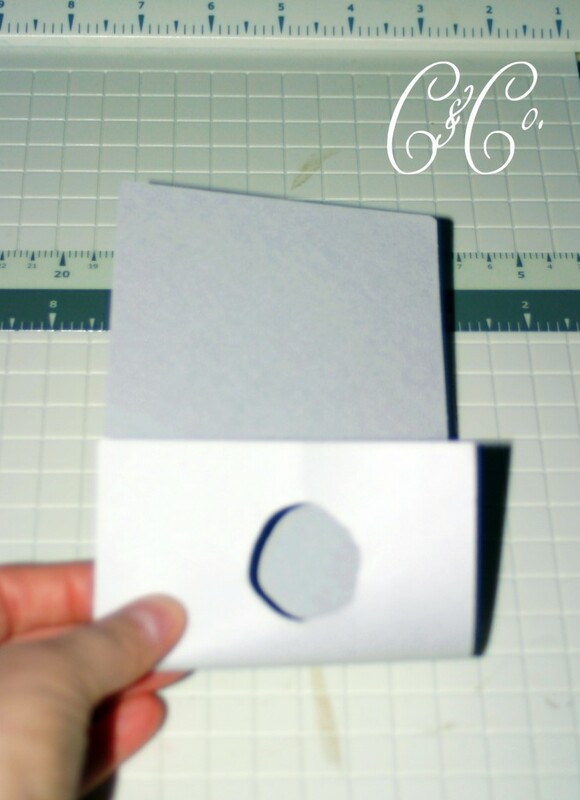 Once cut, apply glue to the back of the paper on the sides and bottom only. Adhere this to the front of your cardstock tag. This will be the pocket for your flavor packet. You can also insert a metal brad on each side of the pocket as I did below. It gives some extra security to holding the pocket in place. Brads are very inexpensive. Now you can embellish. I used an alphabet sticker to represent the teacher’s name as well as some pre-sticky scrapbook flowers. So easy! 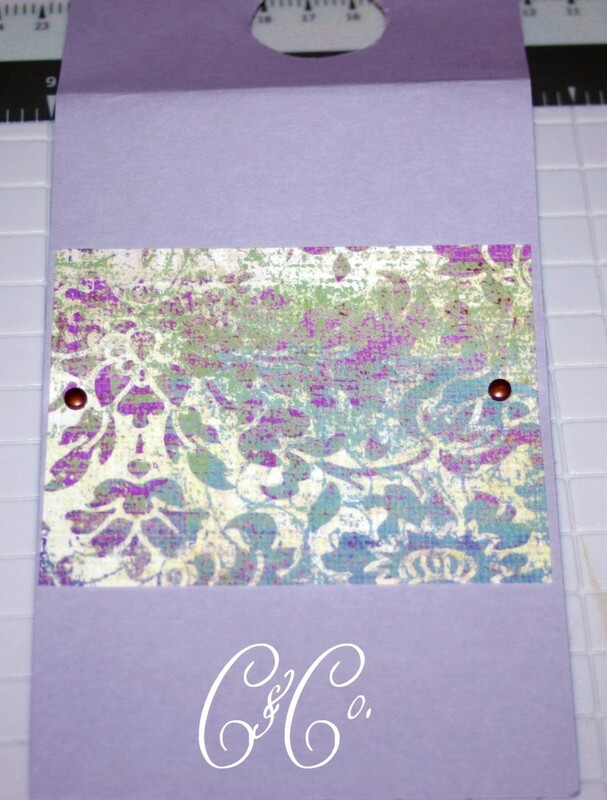 Use cardstock and print out an inspiring quote or your message of gratitude. Ours said, thank you for fostering the thirst of knowledge…. 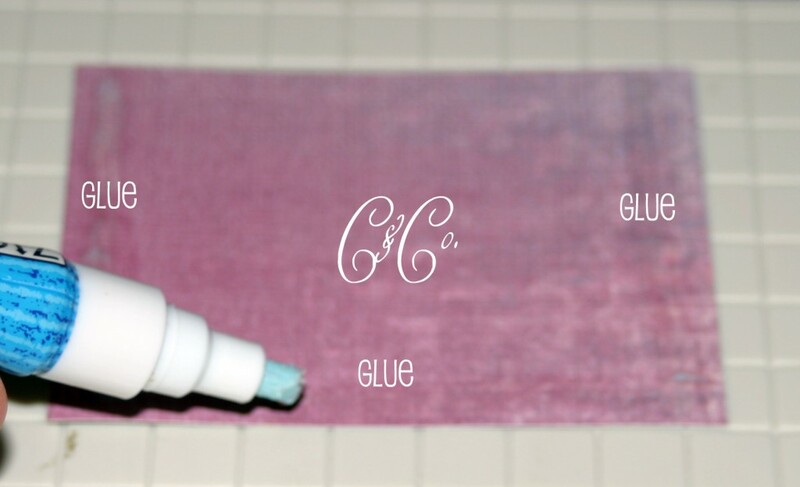 You will use craft glue to adhere this to the front of the water tag. Insert your flavored water packet in the pocket of the tag and place the tag over the bottle of water. You’re done. How easy was that? And your teacher’s will love them. Easy enough to do for multiple teachers. Wow what an awesome idea! We are going to have to try that! Shanna- thanks for always reading and commenting! It means a lot. Glad you like the water bottles. Have fun with them! What a creative teacher gift! The hangers are adorable! Would love for you to stop by and share them at the Tuesday To Do Party. PS…they’d be a great link up to the Pretty Packages party, too…link at top of blog! This is so cute! And such a practical gift too! Sweet gift idea! Simple and inexpensive, and healthy too! Great idea, might try it out one day! What a pretty gift! I want to make some of these sometime! This is a great idea…brilliant!!! What a cute idea! It is definitely something the teachers will use, too. Cute. I think I’ll try this! Cute idea…I missed it for teacher appreciation week, but will work for School Nurses Day this week! I love these too! They would make great party favors too! 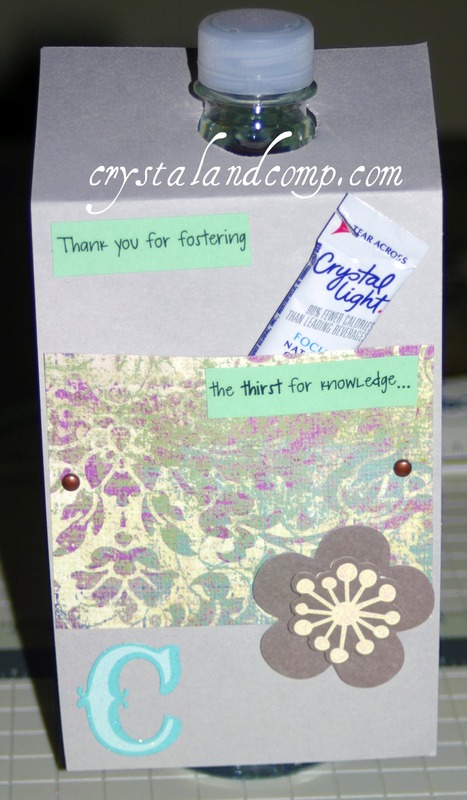 Hi, I just landed here from the Making Monday Marvelous @Craft Link Party. I’m a brand new follower. I wanted to say how pretty these are and I agree they would also make great party gifts. Hi, I’m visiting from the truly lovely link party. I love this sweet & simple idea! My older sister is a 4th grade teacher & she loves gifts like this from her students. Thanks for sharing! I did this for my teachers..for the hangers I used the wider paint sample cards that are free in the paint sections. 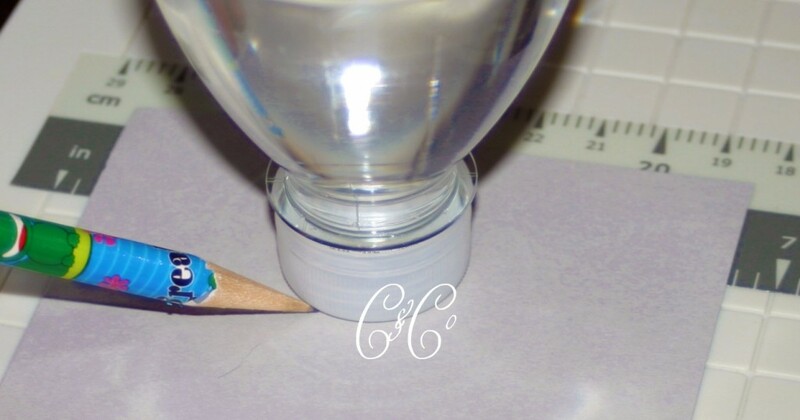 The samples I picked up even had a die-cut hole but I had to enlarge it by tracing the cap over the existing hole. I stapled coordinating paper for the packet holder and overlapped stickers to cover the staple. Thank you Sharise. You are too sweet!